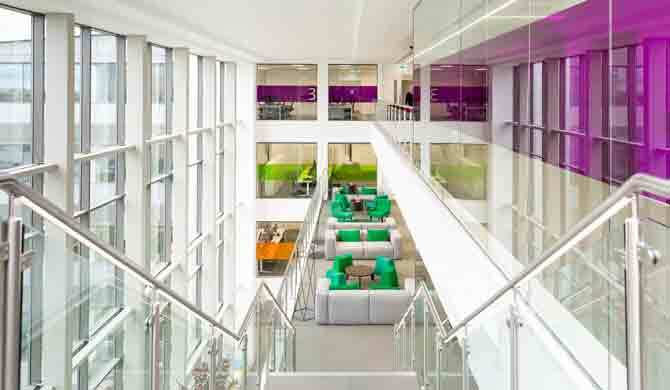 VWFS’ new headquarters in Milton Keynes provides flexible and agile working spaces and a new style of working for the company’s 800 staff. A theatre style conference centre, business lounge, restaurant and a ‘Kombi café with its own tailor made Kombi VW van, all surround a dramatic full height atrium. The office design reinforces the Volkswagen Group brands and company ethos. Following a detailed optioneering exercise to support decision-making by VWFS and the project team, we were able to develop a building services strategy that offered flexible design solutions to suit the Client’s needs, whilst achieving the desired sustainability performance. High-efficiency heating, cooling and lighting systems, supported by an extensive roof-mounted PV array, ensured CO2 reductions and renewable energy targets were met. Using our in-house modelling capabilities to carry out passive solar design analysis we worked with Scott Brownrigg to reduce building cooling load and increase the potential for low carbon cooling strategies including natural ventilation.